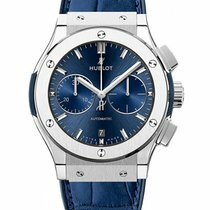 Contrasting the brilliant clarity of the impeccably finished surfaces and the subtlety of splendidly combined colors, the complexity of the neatly arranged dial gives a vibrant twist to the classic appeal of this magnificent timepiece from Hublot. Displaying elapsed seconds via central hand and elapsed minutes via sub-dial, the blue sunburst dial with polished rhodium-plated hands and indices also shows central hours, minutes and seconds, as well as date in an aperture beneath the anti-reflective sapphire crystal. 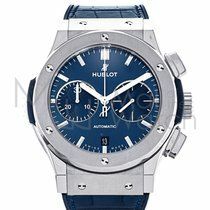 Protecting the automatic HUB1112 caliber, with 42-hour power reserve, the 45mm case is made of polished and satin-finished titanium, featuring six H-shaped titanium screws on the bezel. 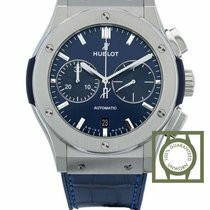 The watch is worn on a blue rubber strap with blue alligator leather inlay and stainless steel folding clasp.